Bhappa Doi-Baked Yogurt with Spiced Orange Syrup - A traditional Bengali dessert with a twist, in this recipe baked yogurt is served with an exotic spiced orange syrup! The good thing about this dessert is that it can be made ahead. As the curtains close on the year 2015, it's time to raise a glass for the new year, Let's roll on a healthy, happy and prosperous 2016 ! There may a be few new challenges, new exciting possibilities, so get ready to face them! JCO wishes everyone a happy and healthy new year! It is always great to end the year on a high and sweet note, and my recipe Bhappa Doi with Spiced Orange Syrup is totally perfect for this occasion as Citrus and Spices both are booming in the winter season. A dessert which is Luscious and moreish and tastes so divine ! Aromatic and Spiced Orange syrup lends totally a new dimension to this beautiful dessert which is only made with 3 ingredients. It looked and tasted phenomenal on the table once it was jazzed up with Spiced Orange syrup, lightly toasted pistachios, edible flowers and fresh mint. This time of the year citrus and spice flavours work so well with each other. 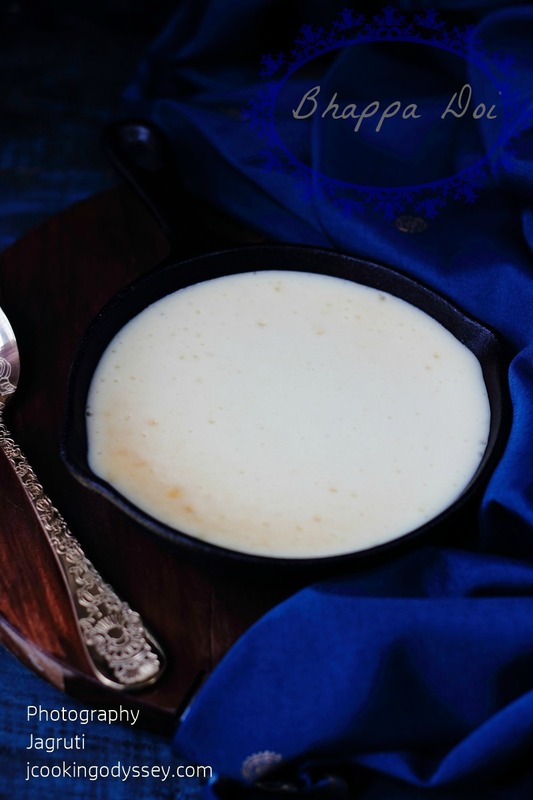 Bhappa Doi ( Steamed and baked Yogurt ) is a classic Bengali sweet ( dessert ) and can be prepared with few ingredients, which are all dairy products. There are two way you can prepare this dessert, traditional way or cheat , both tastes delicious so obviously I chose to cheat :) This dessert would be excellent for parties and get together as it can be prepared in advance. The beauty about this dessert is that it can be made individual in small ramekins or small skillet ( I used small cast iron skillet ). We are a great fan of Bangali sweets, Bangali cuisine is mostly famous for their delectable desserts. Ras Gulla and Ras malai we can not leave alone.Tell you the truth I had not heard about Bhappa Doi, until I left India 25 years ago. Many moons ago on a one cold and rainy afternoon, I was lying on the sofa flipping through one of the cookery book, spotted this recipe. Next day I tried steaming yogurt in a pressure cooker, don't know what went wrong but everything went into the bin and few years went by but I never had any courage to try Bhappa Doi. After a few years, one of the great chefs of Britain went to India, and they made Bhappa Doi with passion fruit coulée, I followed his recipe, dessert turned out so well. Since then Bhappa Doi is favourite of ours. A few years back we had Bhappa Doi in Agra in a restaurant which was prepared traditionally and daughter got hooked on it that now even she whisks up this dessert in no time too, in future will share her recipe too. My family always think that this dessert is an Indian Cheese Cake. 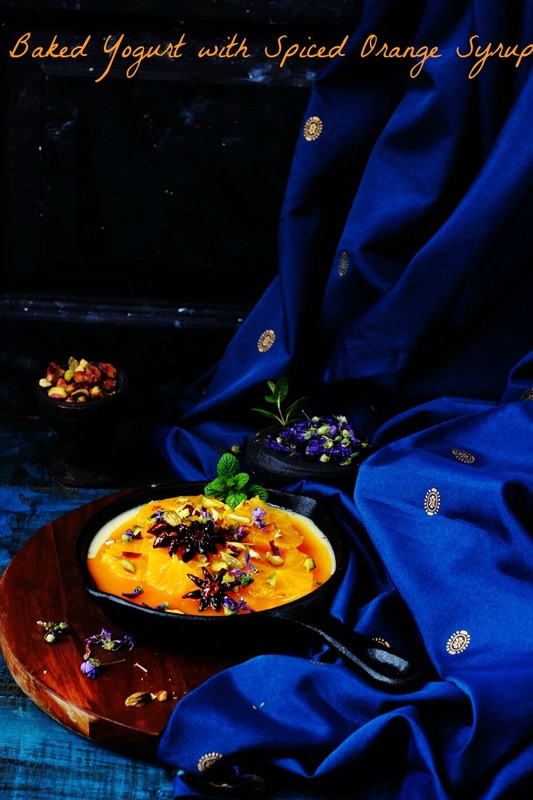 Bhappa Doi-Baked Yogurt with Spiced Orange Syrup - A traditional Bengali dessert with a twist, in this recipe baked yogurt is served with an exotic spiced orange syrup! Preheat the oven to gas mark 4, 180C or 350F. Combine all the baked yoghurt ingredients in a bowl and pour into individual oven-proof ramekins or cast iron skillet which is oven proof. Place the filled ramekins or skillet in a big roasting tray and fill the tray with hot water to about 3/4 of the way up the sides. Turn off the oven and let the yoghurt set overnight in the oven. In the morning cover with tight foil and leave it in the refrigerate to chill. To make an orange syrup, peel orange skin then slice into rounds. Place orange juice, sugar and spices into a saucepan. Bring it to boil and let it simmer until the syrup gets thicker. It will take about 8-10 minutes. Arrange orange slices on top of the set yohgurt, spoon spiced orange syrup on top if it and garnish with chopped pistachio nuts and edible flower. I did use 200g sweetened condensed milk.